Note: Libretto ceased development in 2013. It is delivered as a standard .EXE install file for Windows, requiring a quick A/V scan prior to a double-click to install it with minimal fuss. 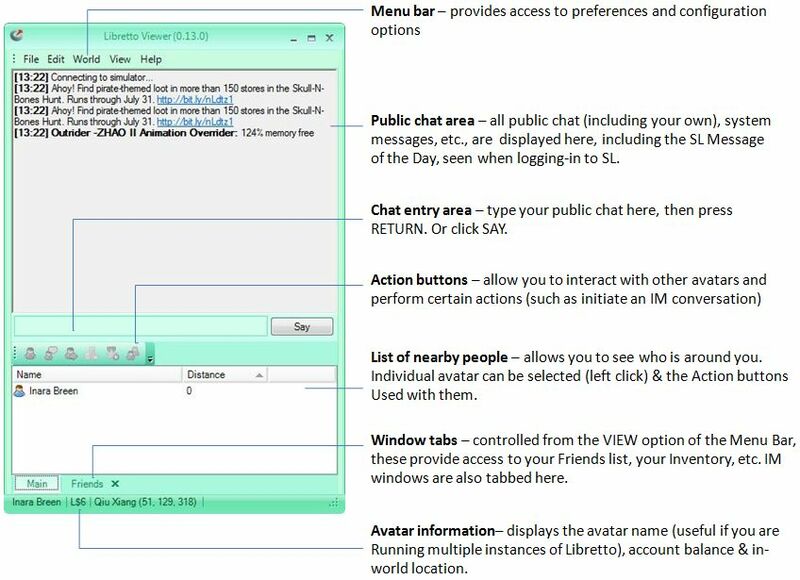 Once installed, it certainly looks somewhat like Microsoft Messenger, with the log-in screen comprising a window onto Libretto announcements and a log-in area with the obligatory check-box for accepting the SL ToS (with link for reviewing!) for people using the client for the first time. A nice touch is once you have logged in with an avatar, the details for the avatar are saved by Libretto and can be accessed from the drop-down list displayed next to NAME. As you are logged in, the Libretto window splits into a two-pane display, with any Message of the Day from LL is displayed in the upper section (where all messages appear), while the lower section lists all those in your immediate vicinity (if any). There are several elements to this display, which are explained below. Help: displays information about the Libretto client. Invite them into a Group. A down-pointing arrow to the right of the buttons takes you to an option to remove or add buttons to the list. Buttons are activated by left-clicking on an specific avatar name and then clicking on the required button (buttons become coloured when active). Find People: opens a search window allowing you to search for a specific avatar (first name; first name+ last name). Matching results are displayed in a list, and the window includes the Action Buttons described above to view an individual’s profile, etc. 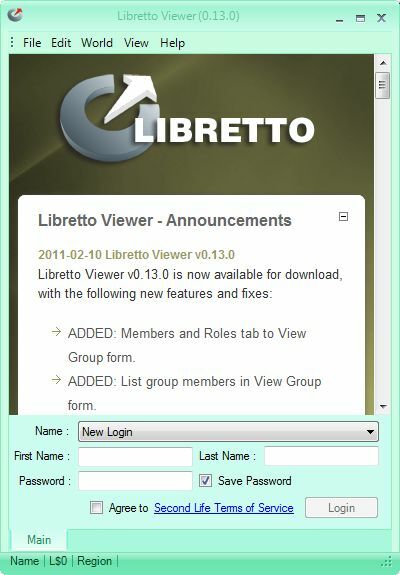 Clicking on an tab name in VIEW will open the associated tab, which can then be closed either by clicking on the tab name in VIEW or by clicking on the X in the tab itself, at the bottom of the Libretto window. Libretto handles multiple instances without issue – simply double-click on the application icon to start an additional session. The Libretto website is adequate, if a little basic in looks and information – but then, the application is so intuitive, you’re unlikely to be spending a lot of time there. Using Libretto is very intuitive and easy to get to grips with. It may not offer all the capabilities found in other text clients, but it really does do, “exactly what it says on the packet” without the need to refer to lengthy help files or anything. Working in chat or IM is easy, while the Action Buttons provide enough functionality to get things done. Libretto is still a work-in-progress, and it is certainly the most lightweight of the three clients I’m reviewing. The window layouts are all clean and easy-to-follow (although the colours are perhaps not so easy on the eye: for “red” read “pink” and for “blue” read “violet”). The current options are sufficient to take care of many basic tasks that don’t rely on an in-world view. Overall, an extremely intuitive application that exceptionally easy to pick-up and use. Hmmm, interesting. Well, I don’t use any mobile devices so see little need for this personally, but I’m curious … what exactly is your presence in SL? Your avatar, just standing unattended? A generic avatar? A plywood prim? 😉 What? If it shows “Avatars near you” (I’m assuming within the 20-meter chat distance) then what do they see? Would seem a bit unsettling to be logged in as an avatar with no view of it or control of it, I’m thinking. What people see depends on the connection. Usually, others will see your avatar eaxctly as you would expect them to see it were you using a Viewer – they have no way of telling you’re on a non-graphical client. Sometimes, however – and just like the Viewer – your avatar remains a cloud. Some text clients provide a rebake function for this, like the Viewer. Occasionally you may appear to be in the Edit Appearance pose for no readily accountable reason. As to determining who is around you, that depends on the functionality supplied by the client – think of it more as a radar function. I have a couple of friends who routinely log-in to SL from their places of work using non-graphical clients and we converse via IM, and sometimes one or other will TP me to their home and we use chat to converse, sometimes joined by others. Other than the fact they never move, it’s impossible to tell they are not using a Viewer. It crashes on logon and requires it to shutdown and send a report to microsoft. Not too sure what thats about. I’m not having the same problem on Windows 7 32-bit. I’ve just tested again, and logged-in OK, but on checking the Libretto forums notice posts have been made from people experiencing crashes as well (no idea if one of them may be you!). Can only suggest you try there. Would be interested in knowing how things go. Trust me, I am not a programmer and wouldn’t know a tcp from a dup. What I do know is that I need a lite chat for sl that runs when I type my name and password. Libretto doesn’t do that, SLiteChat does. Sorry to hear you’ve continued to have issues with Libretto. Hopefully SLiteChat continues to work for you. libretto officially been removed from SL third party viewers directory, and website also down. But for me it was best Lite client to use, and auto login on startup was awesome, Can anyone provide me download like or install exe? I’ve had the website tageed as being down for the last few weeks, but had actually missed it being dropped from the TPV directory. Sorry I can’t supply you with the installer or link. Maybe someone else can. I’ve taken the liberty of altering your e-mail address to prevent it being spammed by any bots hitting this blog. Thank you. Hope someone find it. As its only thing missing now.